I have one sketchbook in which I just practice drawing body parts. Readers of this blog may remember that I slowly sketched the American Sign Language alphabet, from photos that I found on the internet. I also practice drawing faces and feet. 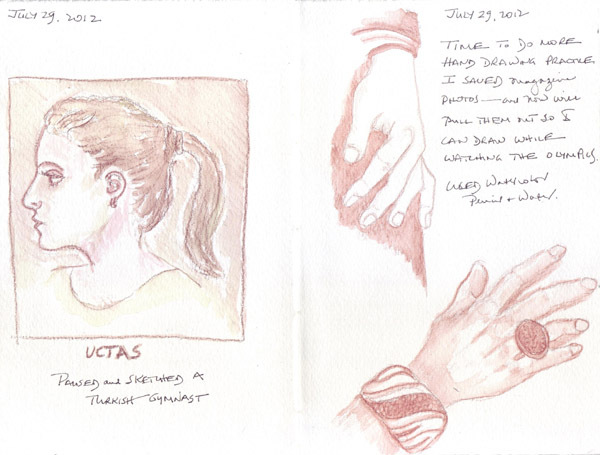 While watching the Olympics, I pulled some photos and this sketchbook for practice, and here are the pages. 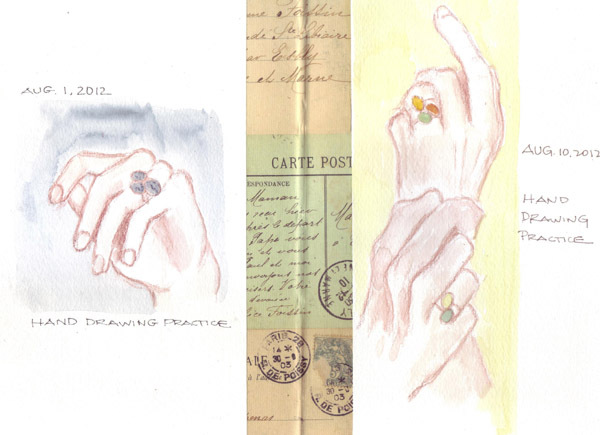 The first two spreads were drawn with watercolor pencils and then painted with water. Portrait Drawing: I no longer remember where I got this idea - but it was from one of the art blogs that I follow. Sorry. I save magazine face photos that fit nicely on my sketchbook page. I then cut the face in half, collage one side to the page, and draw the missing side. This was done in graphite. 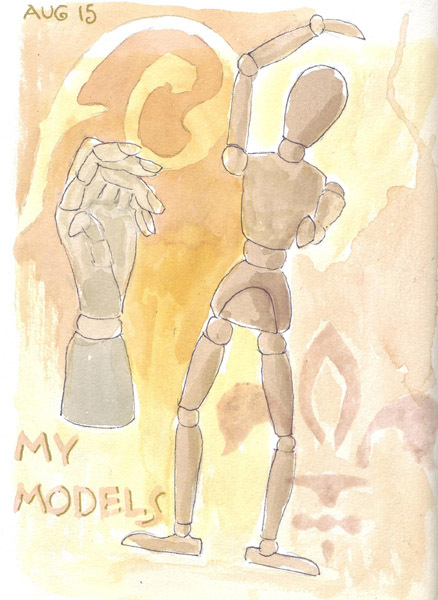 I also have small, articulated figure and hand models that I can draw. I decided to paint them today in order to try two of my new stencils. Melly Testa, in her class Stencil Magic, uses her stencils to make positive images and to paint the negative images. I tried both on "My Models" page. My main goal for the figure was to draw the foreshortened left arm. 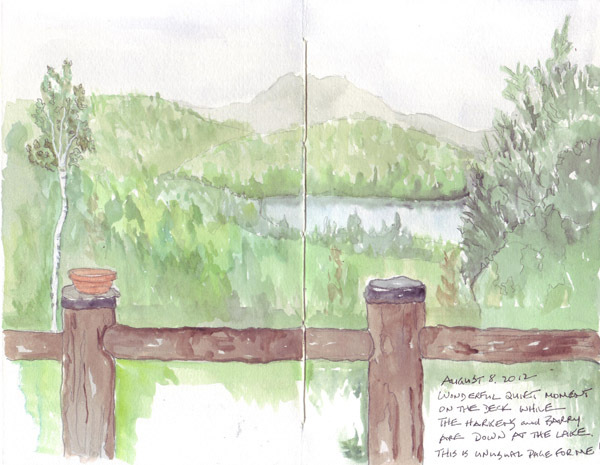 We just returned from a brief visit to Silver Lake, in New Hampshire. We've been visiting our friends there for 10 years, and I've been sketching for 6 of those years. All of my drawings and watercolor paintings are done in sketchbooks, so I've accumulated images of many parts of their home and regular quick drawings of their yellow lab. 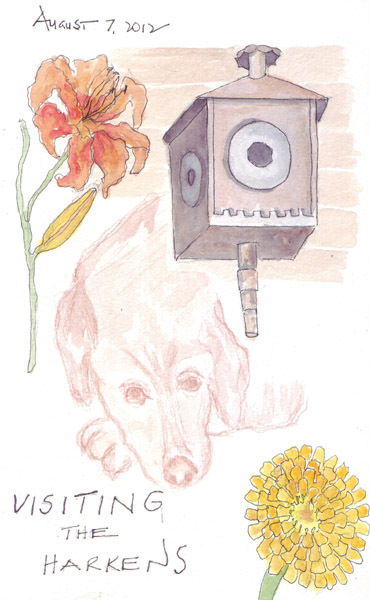 This year Buffie, the rusty porch lamp, and two flowers that were in bloom were all sketched on a single page. I don't like painting landscapes unless they are urban. The house we visit has a wonderful porch overlooking the lake valley and I've only painted it once before, and that was a very simple effort. This year I decided that it was time to try it again. I mix greens from my 3 triads of primary colors, so that and depicting the dense woods were my challenges. 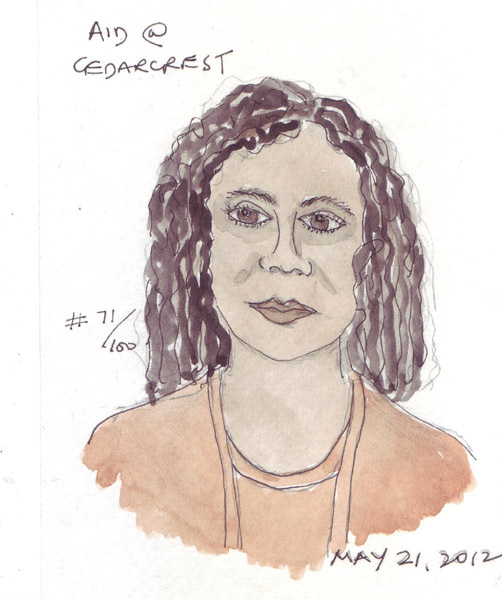 I am still trying to finish my 100 Faces for Carla Sonheim's Drawing Lab exercise #16. I forget about it for weeks at a time. And then as I'm leaving our apartment for a day on buses and/or subways, I grab my watercolor cards and pencil case - and complete several. The first several Faces were from a ride downtown on the #6 subway. 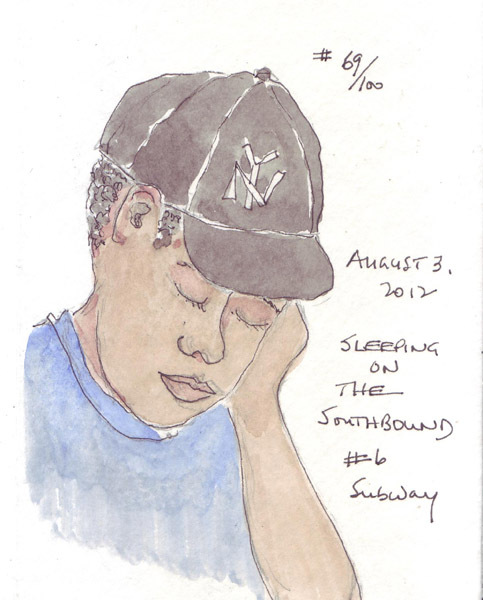 Subject #69 was asleep, but very briefly because he jumped up and got off the train one stop after I started my sketch. 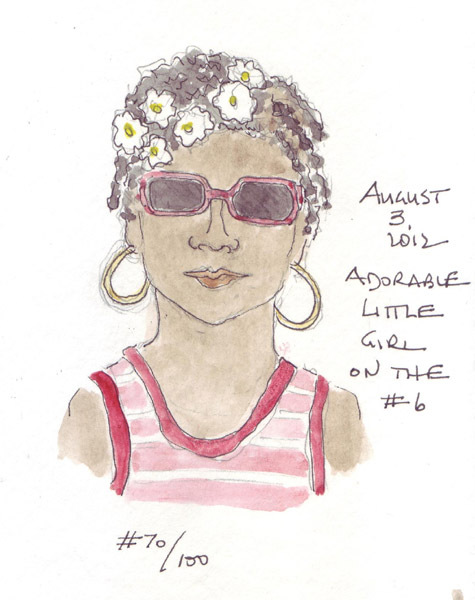 Subject #70 was a gorgeous little girl - with corn row braids and many barrettes holding her hair in place. She had on very dark sunglasses and probably watched me draw her from across the aisle. Subject #71 is a Home Health Aid at my Mother's Retirement complex. I sketched her in pencil several months ago while we all sitting in a common area. But I didn't add ink and watercolor until last night. TWENTY-NINE MORE TO GO BEFORE I FINISH! 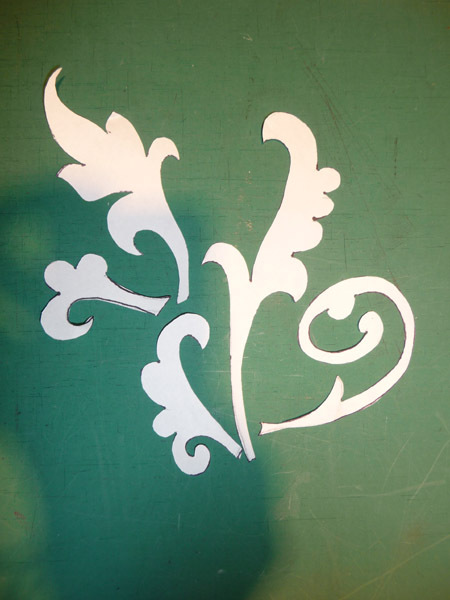 I LOVE Melanie Testa's online Stencil Magic class. Afte finishing the 4 classes, I feel as if I've learned enough to create multiple types of stencils and to develop many different images. 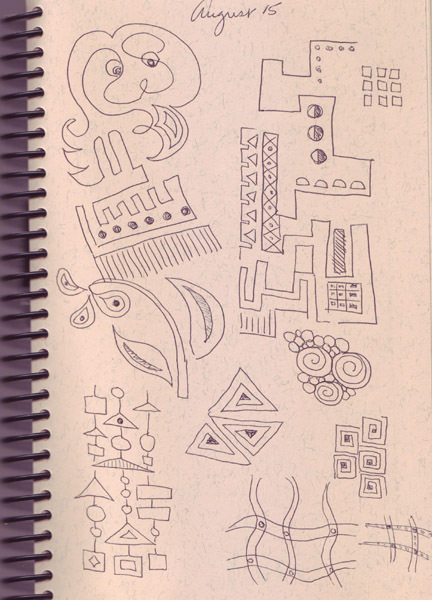 I reworked another doodle and made a stencil from one of the drawings in the lower right corner of this page. The intersections of the grid lines were left blank on the stencil so I can add circles or squares and paint them individually. 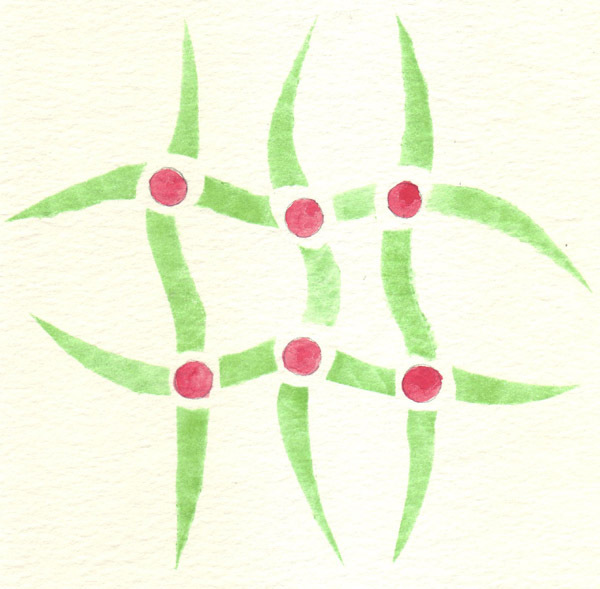 Here is the stencil print which I painted in red and green - might be useful to make cards, tags, and wrapping papers at Christmas if I use these colors. 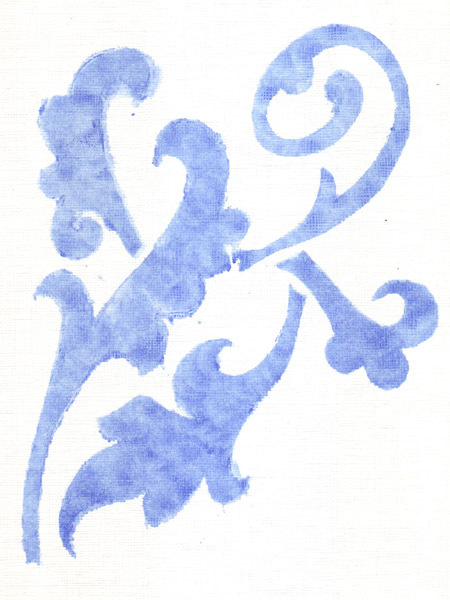 I made another stencil, inspired by an image from Owen Jones' book The Grammar of Ornament (1856) and republished by Dover Books (1987). It was printed with gouache, using a dauber, and the image is much crisper than my first prints. 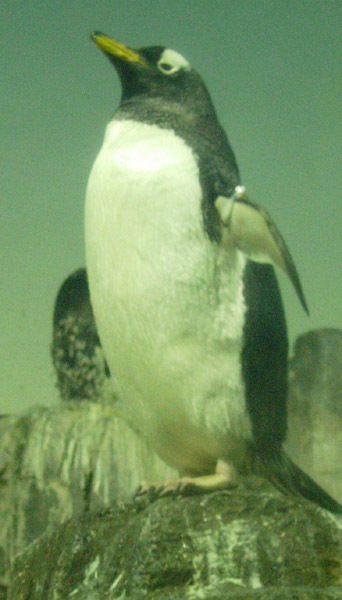 I followed Melly's directions to use photos as inspiration for stencils, and here is my penguin - first my photo from the Central Park Zoo, and then my images. 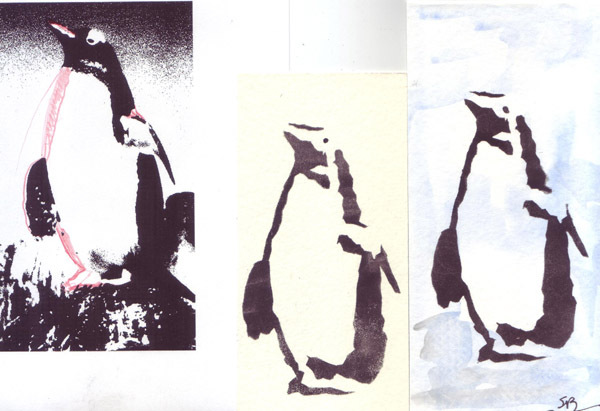 From left to right: My Photoshop manipulated photo to convert it into Black and White as a stencil design, My first print from the stencil, and a Bookmark that I made using the penguin image. I did another exercise using one of my first stencils. I painted watercolor paper wet-on-wet to create background color. 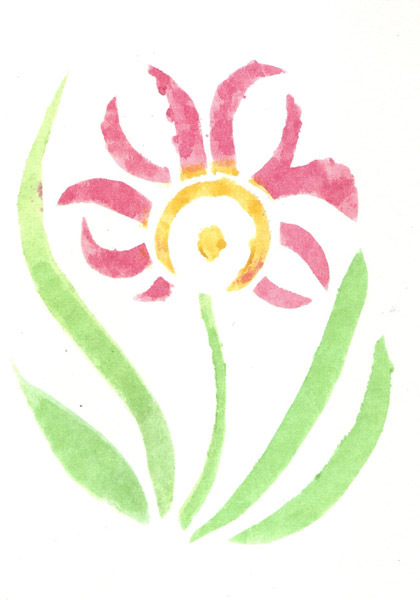 Then I traced one of the images from an earlier stencil with a watercolor pencil and painted the negative space around the image. Finally, I added squares using a piece of construction netting as a stencil and traced and painted circles through a commercial stencil. My friend Melanie Testa is starting a series of online classes through her new website which is called Clever Guild. If you know either of Melanie's books, you know what a talented artist she is - on paper and on fabric. I love the way she uses stencils for background images in her art, and I couldn't wait to take her new online class called "Stencil Magic" so I could learn how to make my own stencils. I am a total novice, making only one previous stencil using contac paper and Shiva paintsticks. For my first stencil, I used a doodle from my "Doodle Sketchbook." 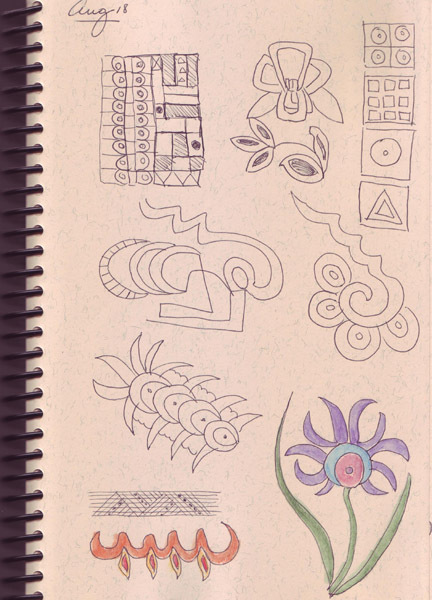 If you are a reader of this blog, you know that I rarely doodled, and for the past year I forced myself to be more creative when I was visiting my Mom and we were sitting having coffee and talking. This is a page of doodles from last August. 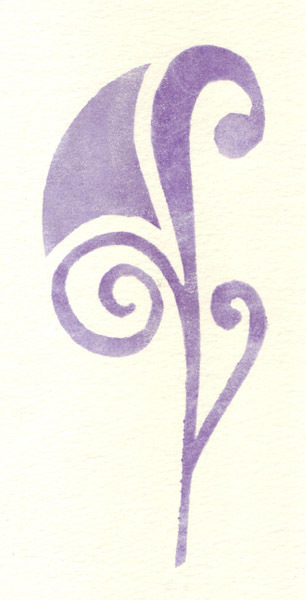 I scanned, cropped, and resized my purple flower doodle to make my first stencil. 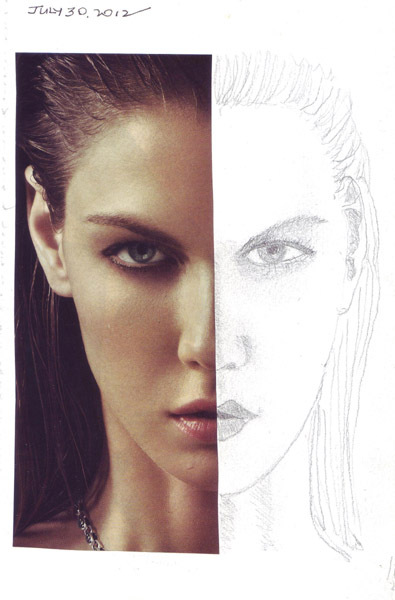 Melanie teaches students how to convert a drawing, or photo, into an image that can be used as a stencil. "Bridges" need to be created on the pattern in order to create details in the image. This is my stencil, photographed over the self sealing mat that I used during the cutting, so you can see the image. Today I decided to use the stencil on paper, even though I haven't reached that lesson yet. It was not a nice crisp image using gouache, but I'm sure that Melanie will teach me the best way to do this in the next lesson. 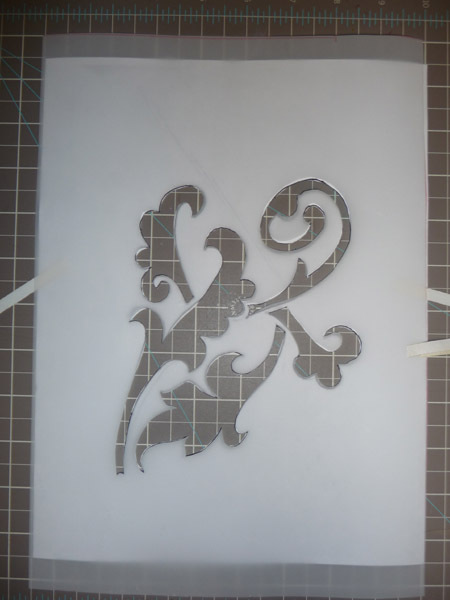 I used a reference book on Medieval Illuminated Manuscripts for inspiration for my next stencil and here is the second stencil that I cut. Here is my first, not very crisp, image using gouache on paper. While cutting the stencil, the mylar is laid over a sheet of paper with the chosen image, and carefully cut out with an xacto knife. 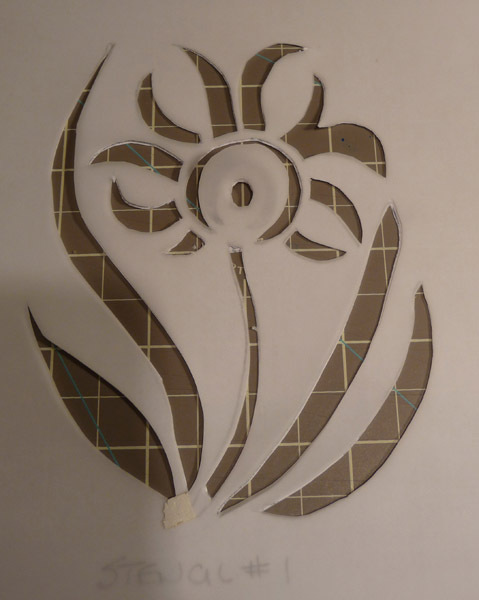 In the process of cutting th stencil, the paper sections are also removed. I saved them and here rearranged them for another variant of this image which could also be made into a stencil. This is a terrific class for anyone wanting to create their own stencils for repetitive images on paper and/or fabric. It is a rolling class, so you have access to all 4 classes as soon as you sign up. And the video access is indefinite, so you can return to them over and over. It's time for me to go watch more videos in the next class!